Being ourselves is not always an easy thing to do. Most of the time we wear masks to disguise our true identities for fear of being ridiculed and rejected. Other times we wear those masks so as not to offend the easily offended, especially in a world of political correctness. 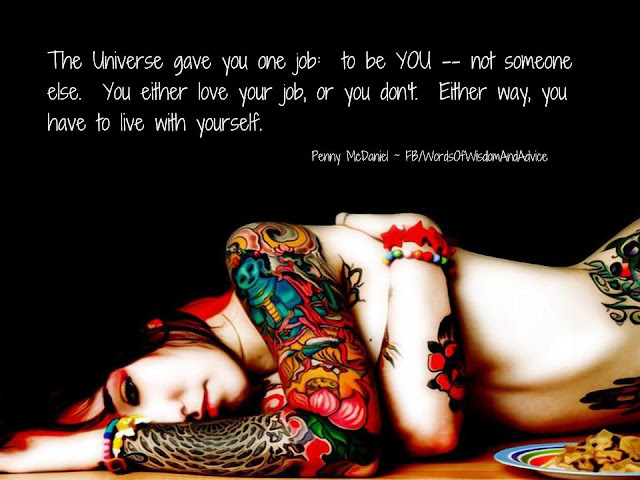 But, the Universe gave you one job when you agreed to incarnate into this world: to be YOU -- not someone else. Oscar Wilde said, "Be yourself; everyone else is already taken." True, but the adage "be yourself" is not as easy at it sounds. However, there are ways to grow comfortable with who you are. First, it's important to define yourself on your terms, not someone else's terms. You can't be yourself if you don't know who you are. This is when you must contemplate your life and your choices. Take a self-inventory. Ask yourself about the things you like and don't like. What attracts you and what doesn't? To what things do you find yourself gravitating? Then act on those things. Your action will bring you into contact with those who are like-minded and who will accept you for who you are. Sure, you may feel self-conscious at first, but that will wear off in time as you get used to wearing your "new" skin. Second, leave the past where it belongs -- in the past. It is gone and it no longer serves a purpose. Forgive yourself for past mistakes. You had reasons for your choices and the decisions may have made sense at the time, but they are done and nothing will change what has happened. Your mistakes do not define you. If anything, mistakes are our reminders of our human side. We are going to make them no matter how informed or educated we are. Accepting mistakes allows us to learn and to grow. Third, don't take things personally. Stop caring about others' perceptions of you. Some people will like you and some won't. You can't be yourself when you are constantly wondering "Am I intelligent enough? Am I pretty enough? Am I popular enough?" These kinds of questions undermine your confidence. If you find yourself around people who don't accept you for reasons of their own, leave their company and seek those whose opinions you value. Internalizing others' negative ideas of who you are is self-abuse. Comparing yourself to others is the quickest route to unhappiness because you give too much power to image, thereby reducing your own power and worth. This is unhealthy and leads to resentment. Fourth, be your own best friend. Value yourself as you value your friends. Do for yourself what you would do for them. Take responsibility for boosting your own self-esteem. Self-affirmations like "I am deserving. I am wonderful. I am worthy" can be very effective. As you positively affirm yourself, others will begin to notice that glow of self-confidence emanating from you. Love and accept yourself as you are, just as you do for those with whom you are close. Fifth, develop your own style based on your terms. If what you like is not mainstream, be proud of it. What matters is that you like it and that it has positive outcomes; it doesn't matter whether others like it or not. Copy-catting a person complements the original and it shows that you are trying to fit in with the crowd. Be bold. Stand out. Be different. There's beauty in being different and it is magnetic. When the Universe created you, it created an original. You are not a copy, nor were you designed to be a copy. You were designed to express your individuality. Our humanity may have its imperfections, but our divinity is perfect in every way. When we accept and love who we are, flaws and all, we can apply this philosophy to others, and in so doing, we become the "perfect" beings we are meant to be. God: He, She, or It?